Mix cut veggies in a large bowl. Heat a large skillet & spray with Pam. Stir fry the veggies in two batches, adding the soy sauce and pepper just as the cabbage starts to wilt. 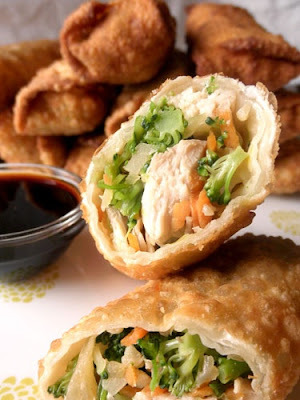 Cook veggies until just underdone to your taste, as they will cook more when you fry the egg rolls. Place cooked veggies in large bowl and mix in chicken. Let mixture cool slightly before rolling. Heat oil, about 1-1 1/2 inches deep, in a frying pan. Lay out a wrapper, brush egg mixture on two adjacent edges, spoon as much as you can fit (3-4 tablespoons) into a wrapper, and roll according to package instructions. Fry egg rolls 4-5 at a time, turning as they get to a golden brown color. Remove to paper towels, or a wire rack to drain & cool. Enjoy.